Now that Carnival Cruise Line has opened up bookings for the upcoming Mardi Gras, we’ve got your first look at the staterooms on board. Whether you’re interested in an interior, oceanview, balcony or suite, the ship has something for everyone — and with a color scheme and style that’s completely different than anything Carnival has done before. According to Carnival, bookings for Mardi Gras have been going gangbusters. “We broke sales records across all of our channels,” said president Christine Duffy. She added that they were seeing “tremendous enthusiasm from guests and travel partners alike.” And of course, this is all taking place for a ship which is still under construction for which some venues have not yet been revealed. 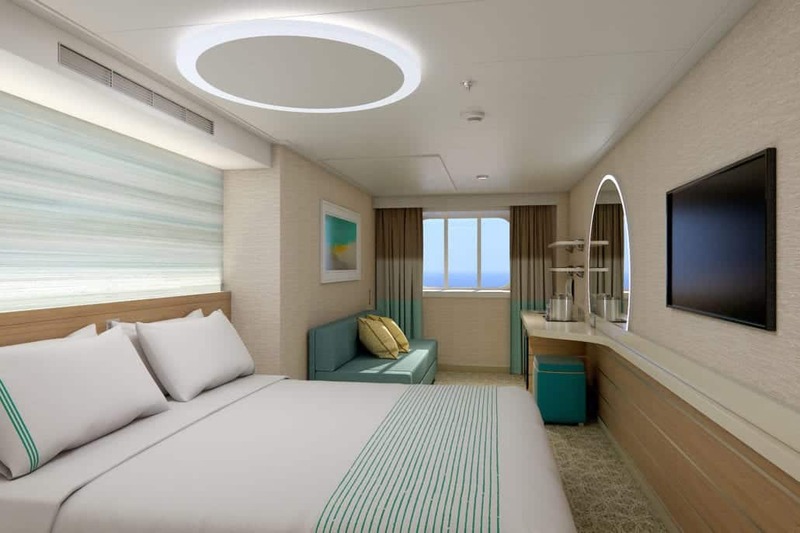 With that in mind, we thought it might be both fun and helpful to get a look at the renderings of some of the many stateroom categories available to help you decide which might be right for you. These will be offered in numerous categories, including a Cloud 9 Interior Stateroom as well as ones in the Havana section. The Havana Interior Staterooms are more colorful than the standard interior rooms, keeping with the theme of the area in which they are situated. They also offer access to the exclusive Havana Retreat area, which will feature a relaxation pool, bar and more. As seen above, the Cloud 9 Spa interior rooms are very similar to the regular interior rooms, although the color scheme is slightly different. The blues, in keeping with the notion of relaxing in a spa, are slightly more muted than the bright blues in the regular interior rooms. For those who want a view — or, fearing seasickness, need a horizon — might find themselves looking at these cabins. With a soothing color palette and fantastic views, these staterooms — which, like most of the oceanview cabins on the ship, feature a separate couch perfect for chilling upon — will help you begin to relax the moment you set foot into them. Is there anything better than having your own private terrace from which to watch the world literally go by as you sail across the ocean? Unlike past Carnival ships, the balconies on Mardi Gras will feature sliding glass doors. One thing that hasn’t changed is the amazing feeling that comes with stepping out onto your balcony and breathing in the fresh, ocean air. Both regular balconies and Cloud 9 Spa Balconies measure 249 feet, with 205 feet being the footage of the cabin and 44 feet dedicated to the balconies. Like on Carnival Vista and Carnival Horizon, Havana Cabanas on the Mardi Gras feature a uniquely styled terrace. These outdoor patios open onto a private walkway accessible only by fellow Havana guests. Passengers booked in Havana staterooms of any level also have exclusive daytime access to the Havana retreat. It’s worth noting that all guests in any Havana stateroom must be 12 years of age or older. There are a wide variety of suites on board, in sizes ranging from the 341 square foot Ocean Suite to the 1120 square foot Cloud 9 Spa Deluxe Vista Suite. While full details haven’t been revealed as to the amenities included, one thing each definitely provides is extra space in which to spread out. The extra space afforded the Ocean Suite allows for a separate sitting area with a sleeper sofa. The heavy curtain separating the two spaces makes this a great option for families. The Premium Balcony Suite features 615 square feet of space, with 410 of those devoted to the interior living areas while the balcony measures a whopping 205 square feet. There’s a television at the foot of the bed and, as seen in the rendering below, both a couch and a table, the perfect place to enjoy a room service-delivered meal. Next up is the captain’s suite, which comes with just about everything… except the actual captain. This spacious stateroom measure 710 square feet. The room itself comes in at 398 square feet, with the remaining 312 devoted to the balcony and its beautiful views. Feeling the need to really spread out? Maybe you feel like you need access to the balcony from both the bedroom and the living room? Then the Deluxe Vista Suite might be calling your name. Bigger than some apartments, this suite measures 861 square feet. 463 of that is interior space, leaving you 398 luxurious square feet of balcony on which to soak up the sun or take in the sights. If you’ve ever thought it might be fun to have a sailaway party in your suite, this would definitely be the place to host it. Between the expansive living room and the massive deck, you and your friends could enjoy quite the good time. And that brings us to the final stop on today’s tour… the 1,120 square foot Cloud 9 Spa Deluxe Vista Suite… complete with a 646 square foot balcony that promises to be the envy of all the other balconies on the ship. ﻿What do you think of these staterooms and suites? Which of them would you love to book yourself in for a sailing on the new Mardi Gras?